The Skeptical Enquirer recently published an interesting article by Bill Nye, the Science Guy, where he discusses the big debate with creationist Ken Ham. Nye points to the YouTube video, Bill Nye: Creationism Is Not Appropriate For Children, that prompted the challenge from Ken Ham. Ken Ham has responded, with a somewhat different version of the events. Of course, Answers In Genesis had already created their own YouTube video, Bill Nye, Creationism is Highly Appropriate for our Children. Nye also explains his strategy for handling the encounter. The article is full of cogent observations about the nature of such an event, which is more of a television show than a debate. I particularly appreciate “My actor’s preparation helped me keep things civil and be respectful of Mr. Ham despite what struck me as his thoughtless point of view.” For the readers of the Skeptical Enquirer, the scientific debate was a slam dunk, and Nye slammed his points home with authority. However, the most important point, to my way of thinking, was one he totally neglects in his comments. In the debate, he made reference to Christians who believe in evolution, but he was really not very effective in delivering this message. Perhaps, he had not included this in his preparation. To Nye, a man of science, the question is whether a given theory is a reasonable explanation of the evidence, not whether a Christian can accept a reasonable explanation. However, to the Creationists in the audience, it is the the salvation of their souls that is most significant. Their experience of life has been been transformed by Divine Love. This is what they want to pass on to their children. So, when someone like Nye, who evidently doesn’t give a damn about his eternal soul, says that “Creationism is not appropriate for children”, they rise up in fury. They see fundamental precepts of their faith undermined in the name of science and atheism forced down the throats of their children. 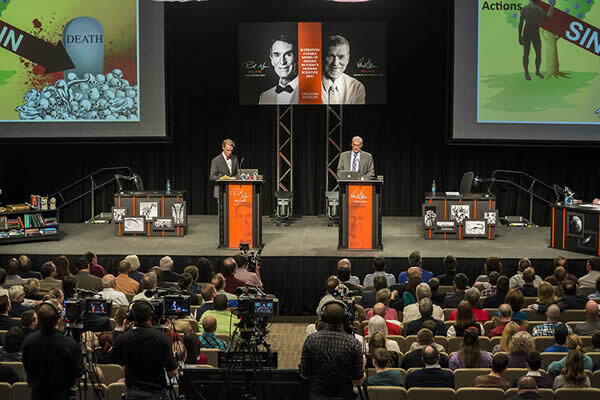 For both Nye and Ham, the debate was about a well crafted question: “Is creation a viable model of origins in today’s modern scientific era?” Ham is devoting his life to maintaining the illusion that there is a scientific question to be answered. Nye looks at Ham’s answers, and sees nonsense dressed up as science. However, for the Evangelical Christian, the real question is not about science at all. It is religious: “Can I be saved, even in this modern era?” I suspect Nye would respond to this with a puzzled look, perhaps followed with a reference to Biologus. Ken Ham’s answer to this question is a resounding “Yes!”, but only if you embrace the willful ignorance of his pseudo-scientific doctrine. It is the Young Earth Creationists’ religion, not the pseudo-science, that is the source of the problem. They have exalted the scientific conclusions of men who lived during the Reformation, when Biblical Christianity first began to take shape, lifting these human concepts to the high altar of Divine Revelation. This is idolatry. It has nothing to do with the teachings of Jesus, or his death on the cross. As one who believes that the Truth will triumph in the end, I am confident that this misbegotten theology will eventually dwindle and die. However, I don’t know how much damage they might do in the meantime.